It’s been a hectic week for me. Mainly because of the storm, and because something happened so suddenly that I myself lost track of time. Anyway, I’m going to post another poem, and please don’t expect too much from it. I have this belief that the more concise a piece of literature is, the more it’s likely to linger in the minds of it’s readers. I wouldn’t tell much of the story behind the poem, as to not to spoil the moment for you. But I just want to dedicate this one to those who lost someone. Be it temporarily or forever, in a heartbreak or in a sudden death, gradually or all at once. This one’s for you. And please, don’t blame yourself. to those who open their being to them. that you forced me to bury with you. 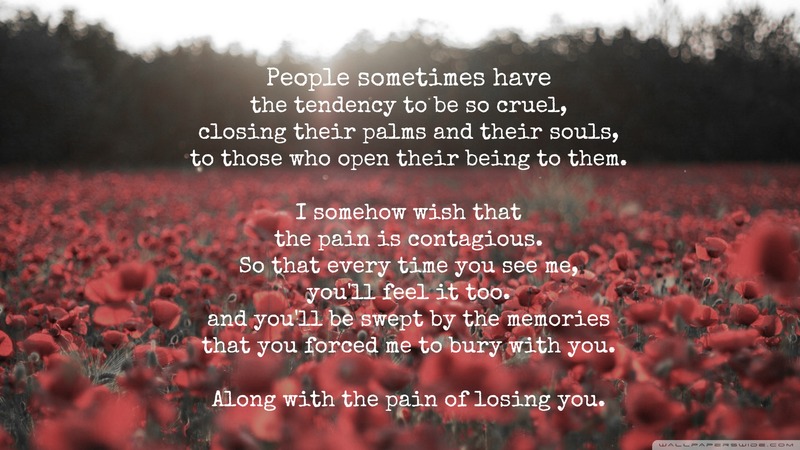 Along with the pain of losing you.